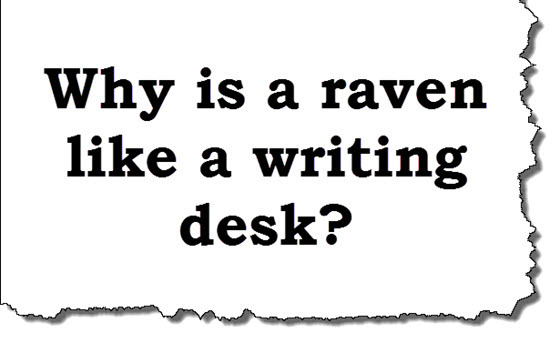 "Why is a raven like a writing desk?" is a riddle proposed by the Mad Hatter during a tea party in Lewis Carroll's classic 1865 novel, Alice's Adventures in Wonderland. Alice was unable to answer the riddle because there was no answer. The Mad Hatter admitted as much. When Alice said she couldn't answer it the Mad Hatter finally admitted the riddle has no solution. He said, "I haven't the slightest idea!" Alice sighed at the Mad Hatter's response and said, "I think you might do something better with the time, than waste it in asking riddles that have no answers." The Mad Hatter replied, "If you knew Time as well as I do, you wouldn't talk about wasting it. It's him." You can read the chapter with the riddle here. The riddle became one of the world's most famous riddles. Carroll did not intend for there to be an answer but her later offered an answer to the riddle in an updated version of the book. Carroll wrote that the answer is, "Because it can produce a few notes, tho they are very flat; and it is never put with the wrong end in front!" Carroll also wrote never as "nevar," which is raven spelled backwards but the clever pun was erased by a proofreader according to Gizmodo. Alice can be thinking about the riddle in this scene from the Disney's 1951 animated version, Alice in Wonderland. Mad Hatter asked Alice the riddle in Alice's Adventures in Wonderland. The riddle initially had no answer. It was meant to be unsolvable. Lewis Carroll offered this answer to the riddle in an updated version: "Because it can produce a few notes, tho they are very flat; and it is never put with the wrong end in front!"